b) I am not really a "primer person". I either don't like the texture/don't feel that they do anything noteworthy/feel that they make my makeup appear heavier. But love it I do. This is the Chanel Le Blanc Light Revealing Whitening Makeup Base SPF35 PA+++ and out of the three shades I was prescribed Rosee to awaken my tired, dull skin. The reason the makeup artist/salesman extraordinaire told me to get this was as follows: whilst it is a white base, and slightly lightens the skin on application, when you put a foundation over the top you end up with luminous and glowing skin. Simple colour theory. And I have to say this kind of works. The "whitening" scared me slightly at first but I haven't noticed any removal of pigmentation (more's the pity) since using it. I love the SPF 35, I love the smell and texture - no greasy silicones but instead a smooth and light liquid formula - and I love the fact that it stops the gathering of product between my eyebrows and nose. It seems to just fill in all the pores and help the subsequent products glide over the skin. 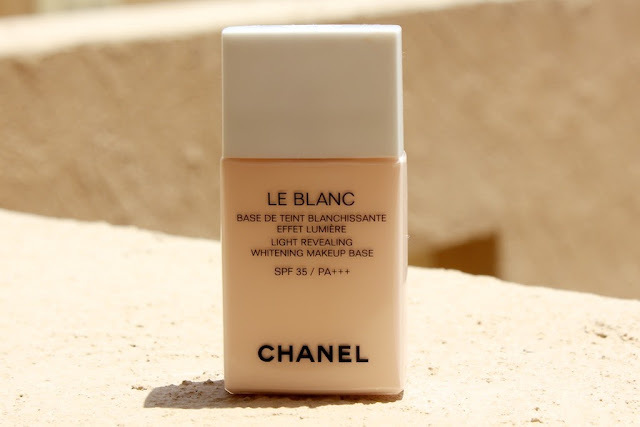 I am not sure on the distribution of this - I haven't seen it in the UK before but I have seen Le Blanc de Chanel which when I think about it, is extremely similar to this in effect but without the whole "whitening" feature which is more appealing to Asian and Middle Eastern markets. Neither would be fantastic for oily skins - zero mattifying - but for those with dry/normal skin types who want to amp up the glow factor then I think you would enjoy a dabble. The packaging is exactly the same as the Vitalumiere Aqua which although diddy and compact also makes it impossible to know when the product has run out. When it does however, I will probably be back for more. I did wear jeans today. I am in denial and pretending that the weather is cool enough to do this. Seeing as I practically live indoors I think I can just about get away with it - it just makes the process of taking photos outdoors slightly sticky and uncomfortable. Bag: 3.1 Phillip Lim mini Pashli - Link! This outfit counts as a sneaky introduction for my new bag. I wanted something black, structured and small enough to serve well as a day/night bag. I am in love with it. The leather on Phillip Lim bags is textured so can withstand some serious wear and tear. This primer sounds really nice. I could be doing with some skin illuminating, plus my make up always gathers between my brows. Love your necklace! Le Blanc is not new, used to be in a frosted glass bottle and to exist in only one version. Not sure it had SPF, though. I was allergic to the original formula, sadly, so I'm curious about this, perhaps it's a bit different now? This is the whitening one and I think it's been around for a while. I remember buying the original Le Blanc in it's big old clunky bottle and quite liked that :) Boo to being allergic - is it the titanium dioxide? Sounds really interesting Laura and I like that it has SPF, but primers are kind of on the bottom of my wishlist as I am like you, not really wearing them often enough. The Blanc de Chanel and MAC Studio Fix used to be my go to's in my early uni days! Feel like going back now! IMHO the whitening label refers to the hyperpigmentation whitening effect common in Korean bbcreams. I could be wrong thou. Oh I really want to try this, it looks like it would be perfect for me. I love the outfit, and your sneaky bag intro. I would love a separate post on it. OMG I LOVE the packaging!! You bought the mini! I've got the large two tone print and also craving a mini now. I love the leather they use, I'm not careful at all and mine still looks immaculate. Can't wait to see the mini's dedicated post! Would love to see a post about the new bag! I love Chanel foundations and tinted moisturiser. This sounds interesting. Although I love my YSL top secret primer. Wonder how it compares.. When I hear "whitening" it usually steers my interest. I rather not have a large contrast between the shade of my face and the shade of my neck/body! Brilliant post as always! I use Benefit 'The Pore-fessional' and can't recommend it highly enough - it is the only primer I have bought more than once. Can I ask, the link to your shoes have you actually bought them from there as I am terrified of being scammed by sites that claim to offer such big discounts? I spotted your new bag before reading on! I love my Medium Pashli so much, I wanted to get another one in a different colour. Would you say the mini is a better variation though? I wish we had that product in the UK, I love the packaging of Vitalumiere Aqua so it would be good to have a primer in that format. Do you love the pashli mini, I'm stalking this bag atm. Do I neeeeed it? I am so in love with your bag addiction! Please do a loubies collection or shoe collection with your valentinos! Would love to see another post on the mini pashli..How much can you fit in it? I've had my eye on the ink version. I love that Topshop blouse - I just got it too! guidelines and requirements.Wait till to complete efficiently setup. GameKiller android tools as well as various other associated android tools. You can also quickly share your streaming with your close friends in simply Mobdro 2.0.30 APK This is since Mobdro ain't yet to be on Google Play Store.